After trying to walk guildies through the process of patching Fetish to be Live Update 18 compliant, I decided to just zip up the updates and send it to them. Then I figured I'd upload it to the site for anyone else who isn't computer savy. Repacked the file into what should be a Winzip and Windows compatible format. Sorry to those of you who do not use WinRAR for the inconvenience. And I'd highly suggest getting it from www.rarlabs.com. It's much better, and supports nearly every archive file format there is. 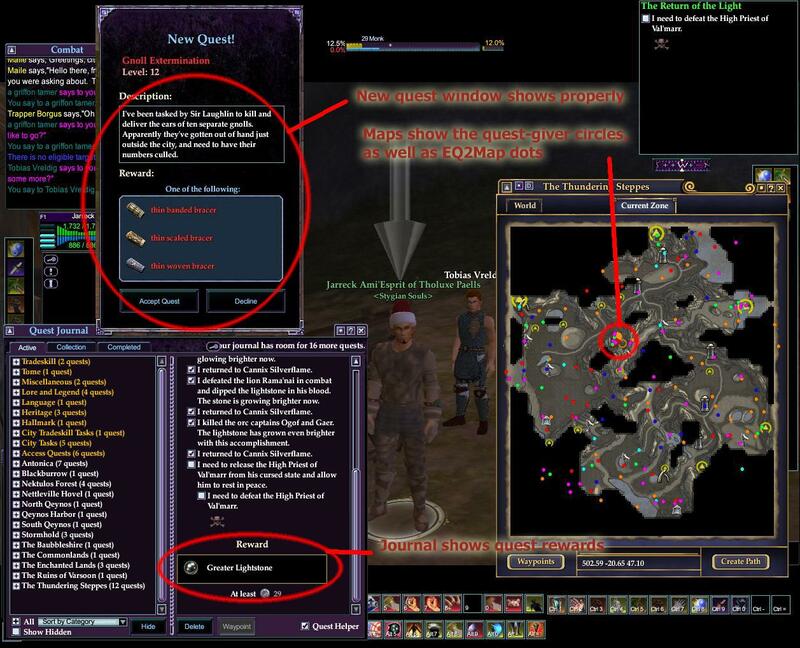 Click on Options and check the box titled "Ask to overwrite MainHUD.Map"
Extract the contents of this archive to your "Everquest II/UI/fetish" directory, overwriting the old versions. !!IMPORTANT!! If you run the EQ2Map updater in the future, when the box pops up asking if you want to update eq2ui_mainhud_map.xml, you MUST click "No"! Failure to do so will mean you lose the LU18 Quest circles on your map. This is a semi-quick-fix for Fetish Nightfall v5.2 to be compliant with LU18. eq2ui_journals_quest - Updated version number, added in the quest rewards to the journal. eq2ui_mainhud_map - Updated to allow for both the EQ2Map dots, and the LU18 Quest-giver orange circles. It's pretty cluttered at times, but I just went for functionality until an official patch comes. 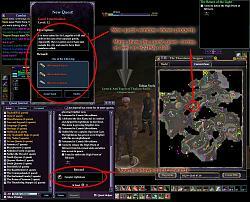 eq2ui_popup_rewardpack - Redid the whole thing pretty much. Added all the new quest reward showing functionality of the window when receiving a quest, made it all Fetish-ized, though the text may not be a perfect match with the theme. Could you please put fetish in the title of this patch so my friends can find easier? The quest journal doesn't show the current, completed etc quests at all... Everything is blank. I dunno if its just me or not, but wanted to let you know. Checked everything I could. works for me great. Keep posting updates! I think you may need to use WinRAR or another such program to open the file. When I redid the patch, I just added the files to the existing archive file and reposted it. Unfortunately, WinZip and a few other programs don't seem to like rar files that have had files added to them. Sorry, it's just habit for me to compress into rar files. In future I'll stick to zips. And I'm not sure what this blue highlight thing is you're talking about. Sounds funky Where is it highlighted? In the archive, or in the fetish folder itself? When I extract this patch, I only see one file: "popup_feedback". Am I doing something wrong? Last edited by krisla : 12-27-2005 at 04:40 PM. Works for me as far I know. Dunno, works alright for me. Did you relog after loading the UI? When you first /loadui it does that, just like showing you have 99,999hp and power, etc. Last edited by Branaddar2 : 12-25-2005 at 06:38 PM.